I am curious how many chill hours you get in Altadena? 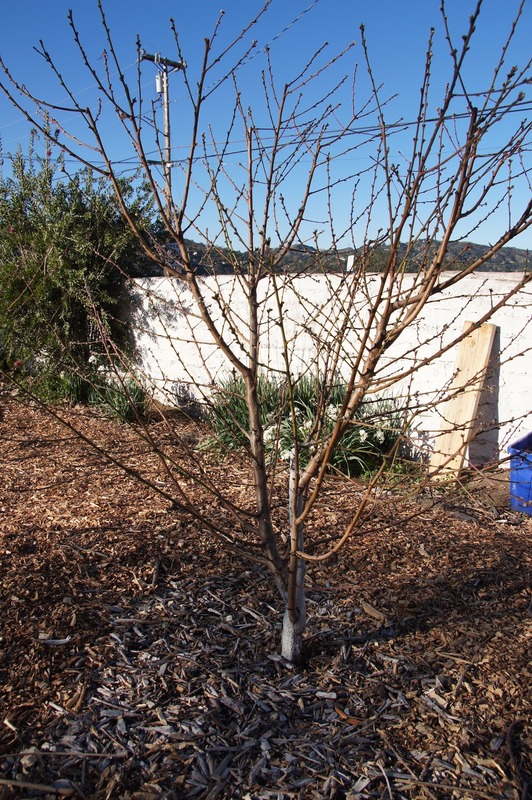 You and I have many of the same fruit tress, mostly for low chill areas, but you also have some higher chill trees like the Wickson plum. I am in Encinitas, so I am lucky to get 200 for the year. Thanks, and your trees look great. Hi Erik. Nice to meet you. The Wickson plum typo resulted from me losing my mind; every time I wrote Wickson, I meant Howard Miracle. I'll fix it now. 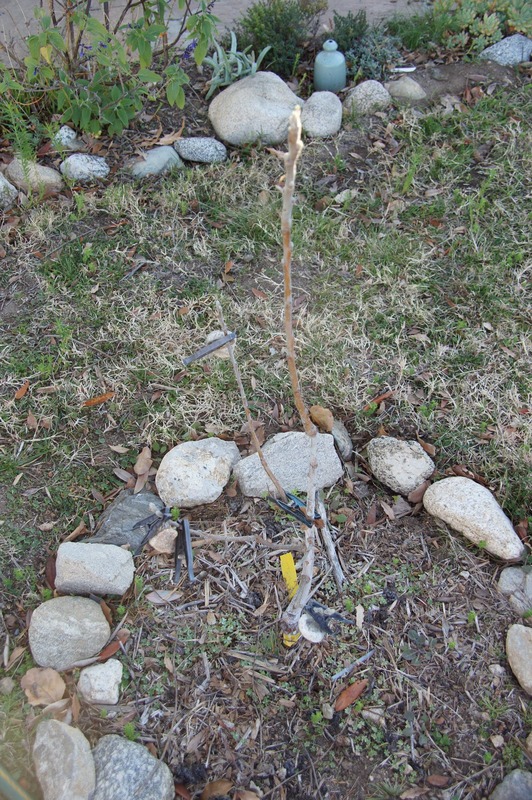 I don't know why I did that, especially since Howard Miracle is my mom's favorite plum, and that's why I planted it! But, we do get more than you--we're closing in on 300 hours so far (calendar for chill hours begins on November 1st). Also, while some of the stone fruit just won't work in warmer climates, experiment with apples, if you haven't already. Many of them are more flexible than we give them credit for. 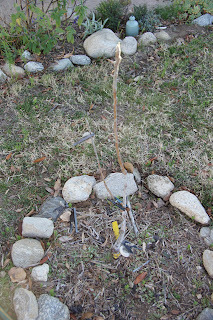 Good luck in your 2012 garden! Where were your fruit varieties bred? If you have a warmer climate, southern European ones might be better. I know varieties from warmer climates don't do well in Britain, and it may be the same in reverse. Are there plums from the south? Alternatively, did you get cold weather at flowering time? It doesn't necessarily take frost to stop fruiting, just weather too cold for pollinators to fly. Hi Robert! I did a lot of research before planting my trees. All of my plums and most of the rest of my stone fruit were bred in California, many specifically for Southern California, where I live. I have a few exceptions, trees with which I'm experimenting. The frost we had last year was very late and unusual, so that is why my Desert Delight got hit. And the trees that haven't given me fruit yet, they're young! 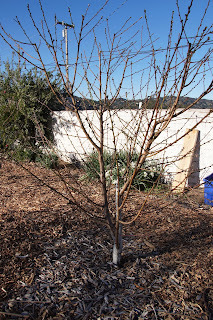 Some trees were planted as recently as last January, so I don't yet expect fruit. I was excited to get the stone fruit I did get, considering how young the trees are. Especially my Eva's Pride. Oh, how I lurve that tree--it thrives in the microclimate of my yard. Thanks for your ideas. 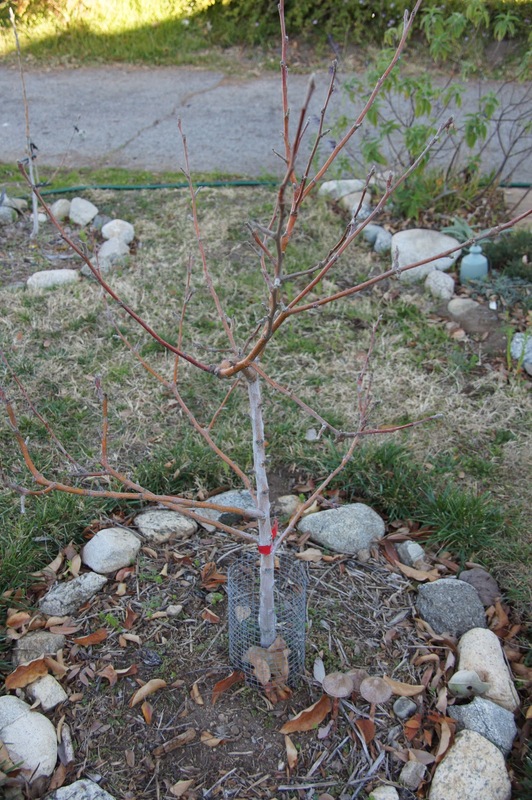 Is there a fruit tree that you love for your microclimate? Hi Lisa! Nice to meet you! I'm not the best expert on White Tiger. I ordered my tree from Trees of Antiquity, a company I really like and from which I've received great customer service. 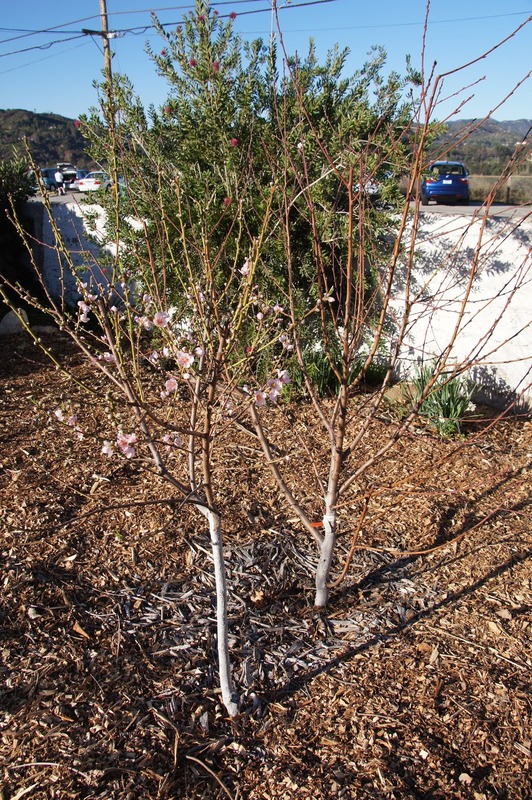 It produced its first year in the ground with two _peaches_! Not nectarines! 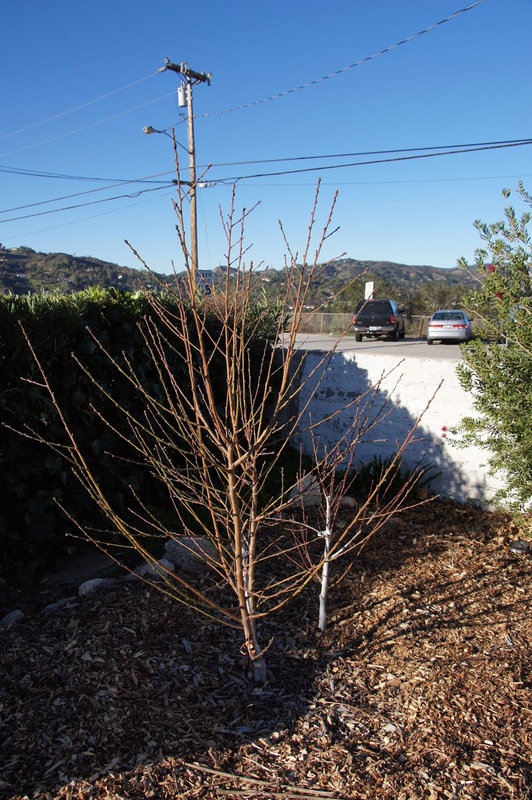 I emailed the owner with pictures, and he told me that two things may have happened: one, and seemingly likely, the tree was mislabeled; and two, the nectarine bud may have reverted back to a peach, which apparently can happen. (He sent me another tree to make up for the nectarine-that-wasn't. I asked for a Mariposa plum, which grew well for me last year.) But, the tree that I have is precocious and appears to be a moderate grower. The fruit the first year was great--firm, very sweet, well-balanced for a white peach/nectarine. However, last year's fruit were simply sweet and mild--maybe because of all the rain last year? Sorry I am not more of an expert on the tree. It sounds like you have quite the orchard! Wow! Which is your favorite of the trees you've listed--is there one you just couldn't live without? The Reed avocados I've tasted that come from our neighborhood have been delicious. I'm really excited to have a tree of my own, and I'm glad that it has a narrower growth, a good choice for the space available in my yard. Once again, thank you for coming by my blog, and I look forward to hearing more from you. The tree I could not live without just for my own favorite is flavor king pluot and strawberry free peach. Santa Rosa is a must as a pollinator, but not my favorite in fruit. Other really good one is that arctic star white nectarine. We made wine out of the desert delight. It produces over a hundred pounds and what do you do with that much fruit that is on for only 20 days? I also ordered the white tiger from trees of antiquity. 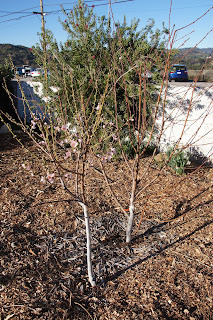 The tree I wanted from them was old mixon peach. When I talked to Neil up there he had grafted it on some other trees or misc. rootstock stuff and was waiting for it to bud out and see what will happen with it. Much colder in Paso Robles than we are and things are quite cold there right now. I also ordered a seckel pear just for giggles to see how it will do. With my luck it will be 20 feet tall and 15 feet wide -- yikes. Only need something around 12 feet. Will be getting them next week and get in the ground and see what happens. Old mixon will get next year and see how that does. Dealing with the no chill stuff has been kind of a challenge. You are colder than me, probably border zone 10/9. I am the other way, 10/11. I went to the ice store and bought about 300 lbs of ice. I iced gravenstein and spitzenburg and the pie cherry every year until 2011. Each got a hundred pounds with a straw bed on top. We get the crazy hot in January just like now and those trees stayed dormant and the ice stayed frozen for about a month. 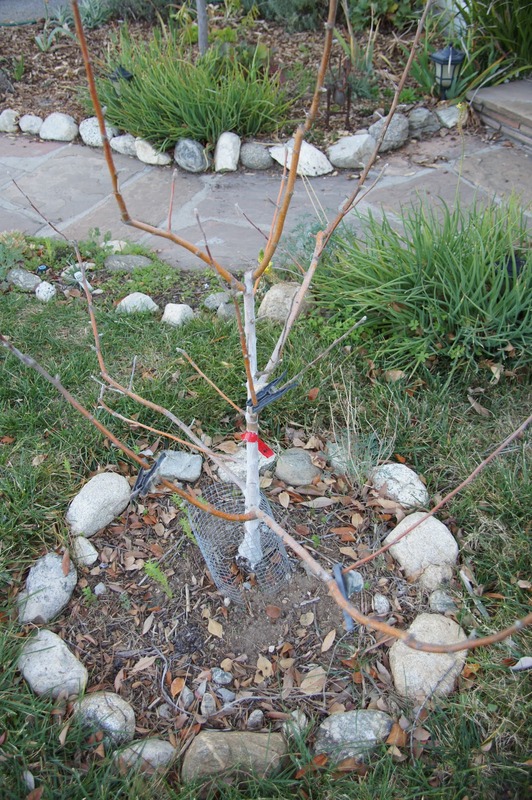 This is a trick I learned from the folks in Northern Nevada who would have trees start to bud out early and they would get a hard freeze come through in April or early May and that would be it for fruit as freeze would kill all the buds. So when that would happen with potentially warm weather, they would get that ice out and ice those trees to keep them dormant. I applied the same concept the other way, rather than keep them dormant, make them dormant. It works by the way, just a lot of work. My special picture is my pie cherry with fruit with the back drop of my big hass avocado in fruit behind it. A subtropic with a high chill fruit tree right next to it. There you go for the folks that say "that won't grow where you live." Just some ideas for small scale higher chill varieties that you can grow here with a little ingenuity. 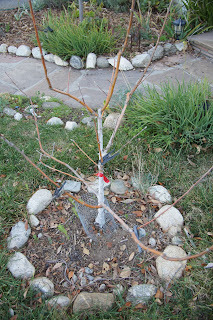 All apples if grafted on Mollings 111 rootstock will grow zone 10, but as far as I know the other stuff not so good. Even though mine are all on M-111, I still iced the higher chill ones and had better results than not icing. I just need them to acclimate a little better to our warm winters. 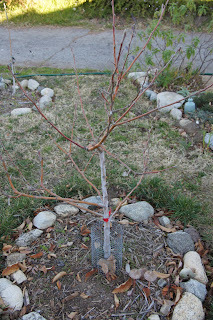 Most of my trees were planted in 2007, so I want to give them a chance to see how they will do with no icing. Still have a few fuji apples hanging in the tree and no apples lost their leaves. So far I am in favor of icing and will probably do so next year. How are your apples doing? Are you dormant or still in leaf? I saw your pruned tree pics. Hard to tell your spacing. Are you about 8 feet apart or more? You have nice low scaffolds which is good. Lower scaffolds is easier pruning the following years and much, much easier picking. Your trees look great by the way!! 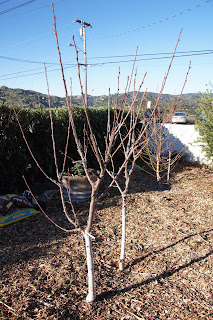 With some of my trees, I have planted them in the "high density orchard" model that Dave Wilson and other sources suggest as a possibility for backard orchards (http://www.davewilson.com/homegrown/BOC_explained.html). So far, I like how it works. When I have paired trees for high density, I have planted only two/hole. There are 10 feet getween each pair of trees (if paired, not all are) or individuals. I am so excited to hear that you are happy with Arctic Star. My young tree only gave me a few delicious fruit last year, but it is beginning it's bloom now, and it shows promise for a larger crop. I will have to check out the srawberry free peach. Yum! And nectarine wine? That sounds amazing. What a good idea about the ice and straw! I am a little late on trying at this year, but I can imagine doing it next year. 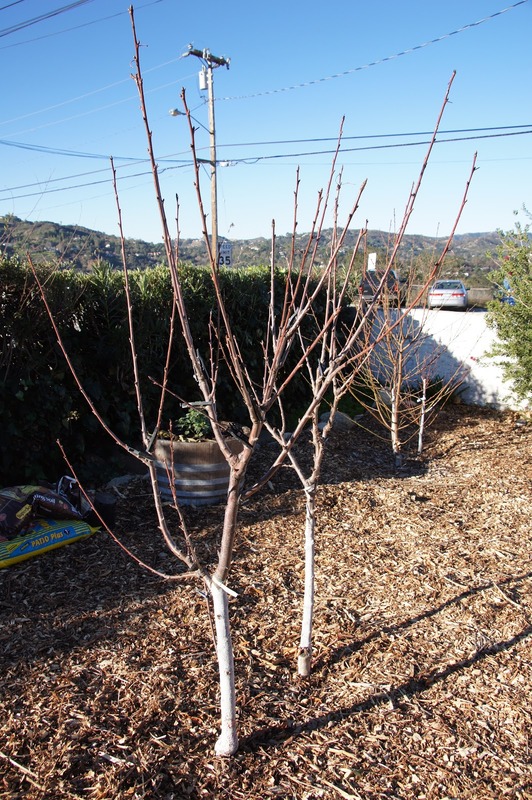 My apples are all dormant--they gave up a little before Christmas and finally went to sleep. Each apple is on M111, like yours. I am really happy with that rootstock so far. Avocado with a cherry in front--awesome! Once again, your orchard sounds amazing. If you are ever in the mood to swap scion wood, let me know.